It's time to get together with my CTMH friends this Sat. Appropriately, we're meeting on 10/4 - National Cardmaking Day! I'm glad that I'm still able to meet with them even though I'm no longer a consultant. It's an informal get together anyway -- no business talk and we all just bring our own projects to work on. Our card swap is usually mostly CTMH product, though. It's been so long since I've sat down and consciously made myself use only certain products that this one was actually a bit difficult for me. And to be honest, I cheated a little on this anyway. For each swap, we usually pick a CTMH paper packet which determines our color selections and sometimes a few stamp set(s) to choose from. 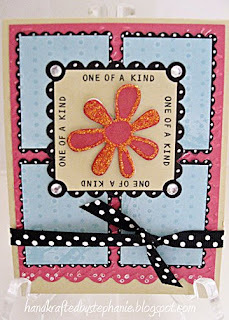 The card design is actually a CASE of Cindy Haffner's amazing card (see it here). CTMH Supplies: Cardstock: (Bamboo, Crystal Blue, Hollyhock, Black); Patterned Paper: Notebook; Stamps: Code It; Ink: Hollyhock; Flower dimensional element. Other Supplies: Cuttlebug embossing folder; Fiskars scallop scissors, SU! ticket punch; rhinestones; white gel pen; Star Dust stickles; ribbon (reasonableribbon.com).